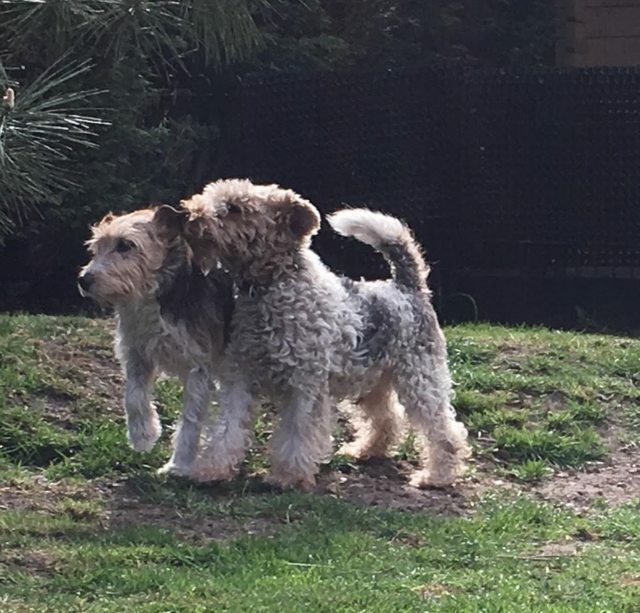 Chouquette and Donnie are 12 and 9 year old female Wire Fox Terriers. We took two very sad girls from France and one of them was the darling Chouquette – used for hunting and left abandoned. She came to the Uk and was so very frightened of people and sounds and pretty much anything. We needed her to go somewhere safe until we could arrange a foster for her that could help her adjust to modern life. 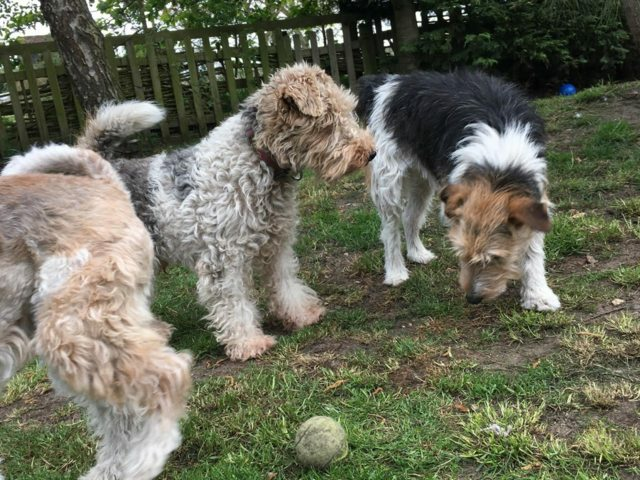 We work with Fox Terrier Rescue in the UK, and they kindly said they would help us and took Chouquette into their kennels, and something very amazing happened. Chouquette became a companion and a big sister to a very frightened boy in rescue: Donnie. 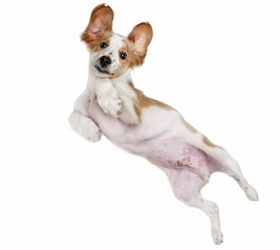 before Chouquette, Donnie wouldn’t interact or play with anyone and was so afraid of people. Both dogs had such a difficult start to life, we feel they bonded and are each other’s strength. So the two must be adopted together. Chouquette is about 12 and Donnie is 9. They will both need a home that will be a quiet retirement home. They would do well in a semi rural or rural home that has a nice large secure garden. They can spend their days playing in the garden, and cuddling with their family at night. Chouquette is the braver of the two and we know that Donnie will follow her lead. 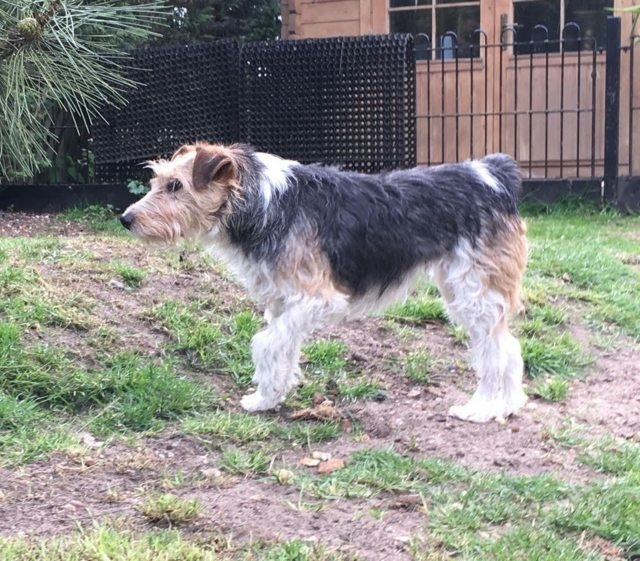 Chouquette is a Fox Terrier Cross and Donnie is a Wire Fox Terrier. They can’t live with young children or small furries. 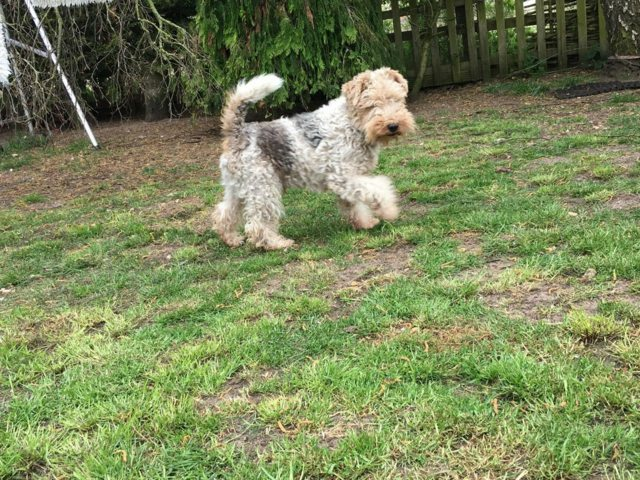 They are currently in Norfolk, and the prospective family would be expected to be able to visit a few times before adoption, this will allow the dogs to get use to you and make their transition far less stressful for them. They are dog friendly, and of course people friendly but they need time and patience, they are the sweetest pair and just deserve to be living in a forever home. Both are vaccinated, neutered and ready for their home. Chouquette has a passport, Donnie does not. If you are interested in giving this sweet couple a home please visit the website and complete a Homing Questionnaire.